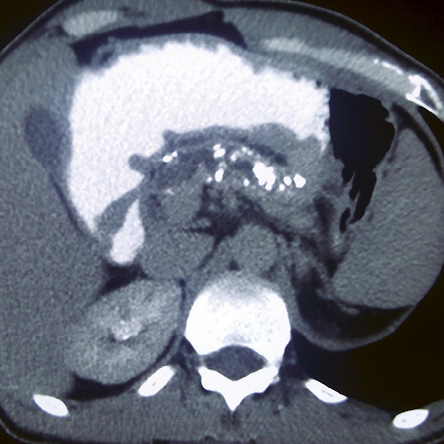 A 30-year-old male was admitted with recurrent episodes of abdominal pain and an episode of coffee ground vomiting. 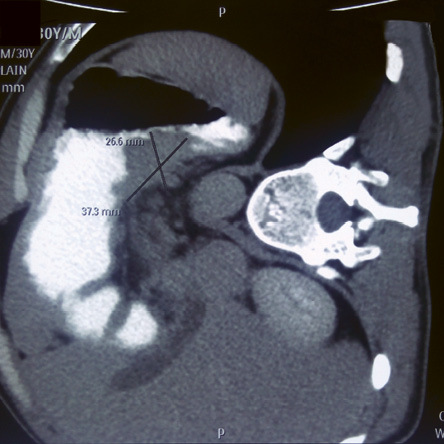 The patient had been symptomatic for two years with multiple episodes of abdominal pain that were severe enough to need hospitalization on two occasions. He had a history of chronic alcohol abuse for 12 years and used to drink alcohol daily. On examination, epigastric tenderness was present, and serum amylase and lipase were elevated at 1 108 U/L and 1 870 U/L, respectively. 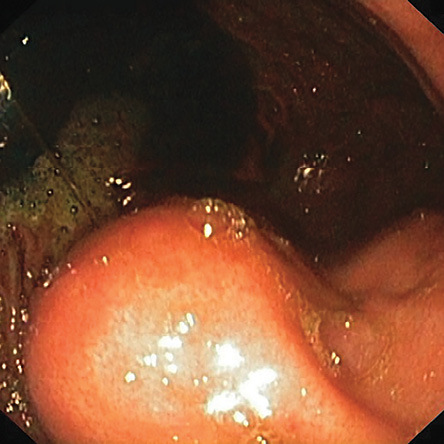 An esophagogastroduodenoscopy was done, which revealed a submucosal lesion firm on probing with closed biopsy forceps in the body of the stomach towards the posterior wall [Figure 1] and a small clean-based ulcer in the duodenal bulb. The antral biopsy for Helicobacter pylori was negative. The patient underwent a computed tomography scan [Figure 2 and 3]. c.Pancreatitis related inflammatory changes of stomach. Figure 1: Gastric submucosal lesion. Figure 2: Computed tomography of the gastric wall. Figure 3: Computed tomography scan of the pancreas.